THE John Logie Baird workshops workshops were given to older primary school pupils in their own school. They were funded by a grant of £4,000 to Helensburgh Heritage Trust from the "Awards for All" section of the Heritage Lottery Fund, and a grant of £3,000 from Strathclyde Science and Technology Forum. A small deficit was paid from the Heritage Trust funds. 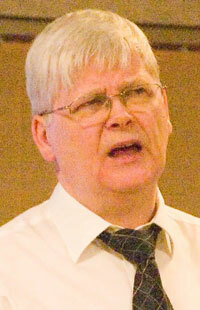 The workshops, conducted by Dr Douglas Brown of Strathclyde University (pictured), ran during May and June 2004. It was a fortunate coincidence that Dr Malcolm Baird (son of JLB) was in Helensburgh during June as part of a promotional visit in connection with "Television and me", an autobiographical book which has a lot of the text of JLB's previous autobiographical book "Sermons, Soap and Television" but a preface has been added. There is a better selection of pictures and many footnotes. Dr Baird attended the workshop in Colgrain School and, later, the A.G.M. of the Helensburgh Heritage Trust.